Malmö is the third largest city in Sweden, and is a common destination for travelers driving between Sweden and Denmark. The city has an interesting mix of historic buildings and modern architecture thanks to a concentration of IT and biotech companies relocating and opening offices there. If you’re traveling to Sweden, this is one city you shouldn’t miss. The Øresund Bridge opened in 1999 and connects Denmark with Sweden. It’s a stunning bridge that provides quite the interesting drive as 4 km of the bridge goes through an underwater tunnel. The tunnel was constructed so as to not disrupt air traffic coming into and out of Copenhagen’s airport. Be warned if you plan to take a scenic drive on this bridge; it’s a hefty toll each way so it will set you back over 100 euros if you decide to do a round trip. The Stortorget dates back to somewhere around 1530, and is the largest and oldest square in Malmö. It was once the largest market square in Northern Europe. In the center, you’ll find an equestrian statue of King Karl X Gustav. 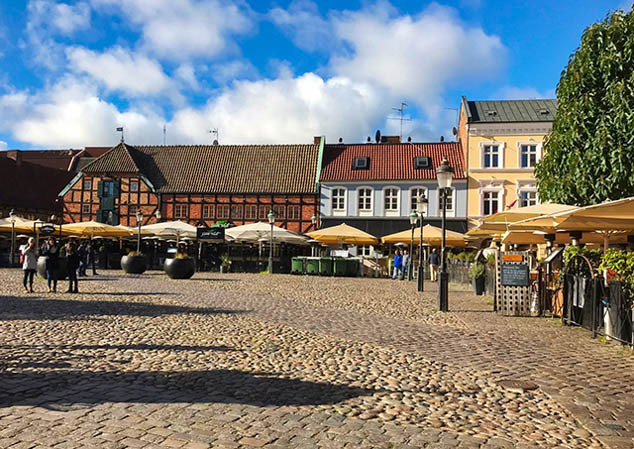 Some of the buildings you’ll find surrounding the square include the Kocksa Huset, which dates back to around 1522 and was the palace of mayor Jörgen Kock. The oldest pharmacy in Sweden, Lejonet, is located at one exit of the square. The pharmacy dates back to 1571, but the building seen today was constructed in 1896. The picturesque square of Lilla Torg is just steps away from the Stortorget. It was created just before 1600 because Malmö was continuing to grow and the town needed a bigger square. You’ll find a variety of restaurants and bars here, along with shopping and other entertainment nearby. Malmöhus Castle is Sweden’s oldest renaissance castle, built in 1436, but destroyed nearly a century later, and then again a few more times during wars between Denmark and Sweden. The building seen today houses four different museums – the National History Museum, Konstmuseet Art Museum, Malmö City Museum, and the Aquarium & Tropicarium. One of the most interesting structures in Malmö is the Turning Torso skyscraper. It’s the tallest building in Sweden and opened back in 2005. It gets its name from its unique architecture that makes the building twist 90 degrees from the bottom to the top. The building houses residential, office, and conference spaces. Nearby, you’ll find Stapelbäddsparken, the biggest skateboarding and climbing park in Europe. Be sure to check out Folkets Park, which is an amusement park similar to Tivoli Gardens in Copenhagen, Denmark. There are spacious green areas and ponds where you can relax or enjoy the amusement park rides between April and September. During the winter, the pond is turned into an ice staking rink. Folkets Park is also called People’s Park, and it’s said to be the oldest public park in the world and has been a draw for tourists and locals alike for over 120 years. Travelers wanting to stay in Malmö will find a variety of hotels to choose from, ranging from budget to luxury options. However, as Sweden can be considered pricey, budget hotels may still feel expensive depending on what your expectations are. Malmö is full of interesting restaurants and bars, but they can fill up quickly. Reservations are essential at popular places so keep that in mind if you find a particular restaurant you want to dine at. Also, look into the Malmö City Card if you’ll be in the city for a few days. This card provides discounted admission to many attractions and shops in the city. Follow us on Twitter where we share even more great stories and photos! Security and Political Evacuation Travel Insurance: What Is It, And What Does It Cover? One important coverage to look for when choosing a travel insurance policy is the Security & Political Evacuation benefit, which can provide assistance at a dire time. Many of the most popular tourist countries are now requiring visitors to have travel insurance before they are allowed to enter. This list can help you prepare for your upcoming trip. Erin is a travel and food writer who currently splits her time between the Netherlands and Belize. She's traveled to 60+ countries on 5 continents with a passion for culinary travel, luxury hotels, and all things Disney. Her writing has appeared in numerous online outlets including Gadling, BootsnAll, CNN, Art of Backpacking, TravBuddy, CBS, and more. She was the major author of Belize's official visitor magazine, Destination Belize 2013; wrote the official AFAR Guide to Belize; and is also AFAR Magazine's local Belize expert.. In addition to writing for other publications, Erin maintains several blogs, Our Tasty Travels, No Checked Bags, Pooh's Travels, and the brand new Caye To Belize. Follow Erin on Facebook, Twitter, Pinterest and Google Plus.